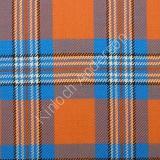 The Irn Bru Tartan was originally called the Barr Tartan and designed in 1969 by Howe Design. 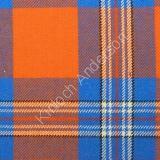 In 1996/97 it was redesigned by Kinloch Anderson and the name was changed to Irn Bru. 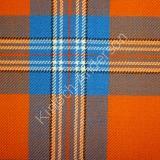 It was registered with the Scottish Tartans Society on 12th September 1997. The iconic Irn Bru drink (Iron Brew) was first produced in 1901 by AG Barr and the colours for the tartan are based on their brand label.